Wisdom: Son, Brother, Friend. Making the most of what is given. In 2009 my husband and I met Wisdom, a 12 year old orphan, new to MCM. Every time we have gone back to Malawi over the years, Wisdom has been one of the familiar faces who has become etched into our hearts, and has become so much more. Wisdom lost his mother just three months after he was born and he never knew his father. His maternal grandma raised him, but at about 16 years of age she passed away, and he was left to live on his own. In 2008, he was able to start attending MCM and he told me “I am not an orphan because I have you. When I am at MCM I feel like I am with my parents”. Wisdom knows the practical help that MCM has offered him over the years, but what struck me on my recent trip was the way in which he is now so influential as a young adult. 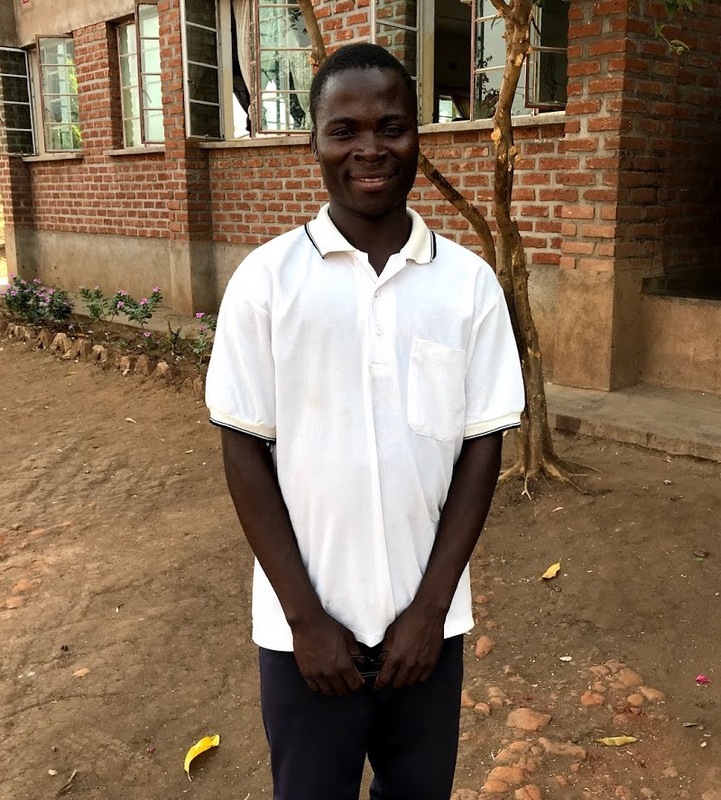 Although he has finished high school, he is at technical college studying journalism, wanting to fulfill his dream of becoming a TV and Radio Announcer. (Just as an aside on previous trips, Wisdom would interrogate our teams begging them for English words to add to his vocabulary list so that he could master the English language for his future profession!!!) During his time off he spends his time at MCM, talking to the kids, and is a natural mentor/leader to the younger children. It’s part of who he is. He knows where he has come from…he knows the struggles the orphans are facing in their homes and in their villages. Wisdom does not complain, and he is able to see God’s provision and kindness in the messiness of his life. He took us to his home in the village. A hot, dusty walk – probably 40 minutes from the center…requiring a twenty minute walk to collect water three times a day (in each direction) – it was over 100 degrees when we were there! His roof has recently collapsed as the ants have eaten the poles holding up his roof, and yet we never heard a word of complaint as he is staying with his aunt Linda (whose roof poles are also being eaten by ants and whose metal sheeting is full of holes!) The faith of these beautiful people pierces me. So often we would meet the most gracious of souls who would remind me that God will make a way where there is no way. Wisdom and his aunt are two of these people. I call Wisdom a son…because he really could be my son – he is just four years younger than our twin sons, and has the same dreams and aspirations as they do, but will never have the home, the care, the parenting, the opportunities they have had….and yet, he considers himself blessed! He is grateful! Oh, how that raises questions for me here in the US about gratitude, contentment, entitlement, justice, how does God want me to interact and respond personally? I call Wisdom a brother …in the faith because I truly have a lot to learn from this young man thirty years younger than I. His questions, his acceptance, his grace teach me where I have become jaded. I call Wisdom my friend…because as he has matured into a fine young man, he truly is someone I want to spend time with, I admire him, he’s courageous, he’s a survivor, he’s generous, he’s gentle, he’s funny, he’s kind and I want you to meet him too!